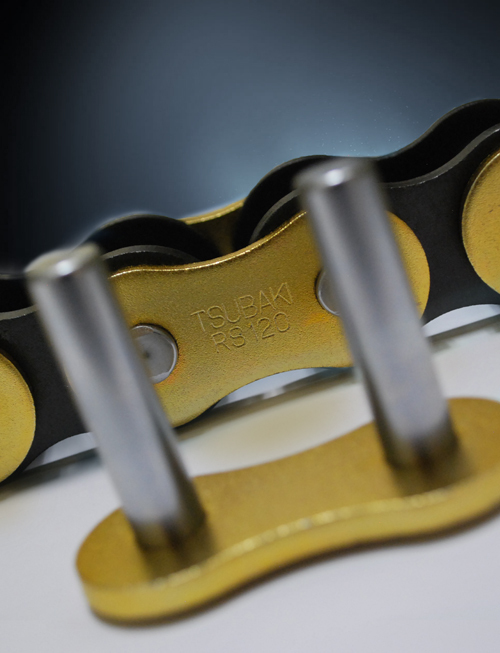 Titan chain’s construction incorporates the latest result of Tsubaki’s R&D to improve roller chain’s wear life made for harsh and high-speed environments. Tsubaki’s Titan Series Chain embodies all the best features of our standard ANSI chain paired with the latest and exclusive features that outperforms competitor’s chains. Special coated pins that provide an extra hard, low friction surface that limits the wear between the pin/bushing area, significantly increasing wear life, and providing robust performance even in high debris environments. Zinc coated pin link plates and black oxide roller link plates provide an extra layer of protection for corrosion. Solid Lube Groove Bushing - Tsubaki’s PERFORMAX bushings are cold formed from a solid piece of steel providing seamless construction providing better surface between the pin and bushing while the lube grooves on the inner surface of the bushing retain oil at the point of contact further increasing wear life. Offered in sizes 80-140. Tsubaki’s patented ring-coining connecting link increases fatigue strength and durability of the chain. The unique process causes positive compressive stress around the pitch holes to counteract shock loads. Titan Series Chains are available in a variety of options for your drive chain applications including single and multi-strand, attachment chain, made-to-order and available in sizes 35-240. One of our customers is one of the biggest players in the aluminum billet industry. They were having issues with their rotary drum furnace and called on the Tsubaki team to see how the issues can be improved. This aluminum billet producer was experiencing rapid chain elongation and the odd breakage every 6-8 months on their 200RB chain installed on their rotary drum furnace. The customer grew exhausted constantly having to repair the 200RB, hence they decided that a permanent solution to increase wear life was warranted. After investigating the scenario, we recommended the heavy series of our new Titan Series Chain. Tsubaki’s heavy series chain was suggested to address the odd breakage; this resulted in a 20% increase in strength. To address elongation and inability to lubricate due to high temperature, our Titan Series’ innovative hard-chrome plated pins provided a solution. The hard-chromed plated pins have ultra smooth surface and is extra hard, thus, reducing friction on the pin/bearing area while at the same time providing extra strength prolonging wear life. The recipe Tsubaki suggested has been running on the application for a full year without encountering any breakage or elongation. Chains are used in a wide range of industrial applications. Everything from power transmission, lifting, conveyance and everything in between; often in corrosive environments. The go-to material for most chain is mid-to-high carbon steel. These steels, while having good strength characteristics, can be heat treated, are easily machined and formed, and readily available. Unfortunately, they do not lend themselves well to corrosive environments. It is well known that carbon steels in the presence of water and air will corrode, most often in the form of rust. The presence of salt or other chemicals can increase the rate of corrosion significantly. There are several ways to reduce the rate of corrosion, although eliminating it is nearly impossible. The easiest and often the most overlooked solution is to lubricate the chain. Not only will proper lubrication contribute to optimal chain performance but oil will provide a protective layer around the chain, displacing moisture, and preventing rust from forming. Many food grade lubricants will provide this protection as well. Of course, there are many applications where lubricating the chain is not desirable due to environmental or product contamination concerns. As the name implies plated chain improve corrosion resistance by adding a protective layer on the surface of the chain. Tsubaki Nickel Plated (NP) chain is available in all sizes. Each component is electroplated prior to assembly. NP provides a cost-effective method of moderate corrosion resistance in water applications. Generally, it does not perform well in salt water or chemical environments. Applications where the chain is subject to high impacts or sliding should be avoided. Tsubaki Neptune™ (NEP) chain is a mechanically applied multi-layer zinc coating that provides good corrosion resistance in water, salt water, and mildly alkaline environments. Especially like those found in applications that require periodic washdown. Since NEP chain is mechanically coated instead of electroplating it has superior adhesion and scratch resistance. Plated chains are not suitable for direct food contact. Providing the best of corrosion resistance and temperature range, Stainless Steel (SS) is the material of choice for many applications. They are generally highly resistant to corrosion in acidic, alkaline, and wet environments. Additionally they can operate in much higher temperatures than standard Carbon Steel chain (-20°C to 400°C). Tsubaki SS series chain is made completely from 304 stainless. It can operate in a wide range of corrosive environments. However, it must be noted that the strength of SS chain is 90% less than the equivalent carbon steel chain. Loading review must be completed when considering switching from standard chain to SS. Often a SS chain 2 to 3 times larger must be used to replace the equivalent carbon steel chain. “AS” series and bushings are made of precipitation-hardened, tempered stainless steel, while the plates and bushings are 18-8 SUS. This combination results in a maximum allowable load 1.5 times that of SS series chain. AS series has lower corrosion resistance than SS series. 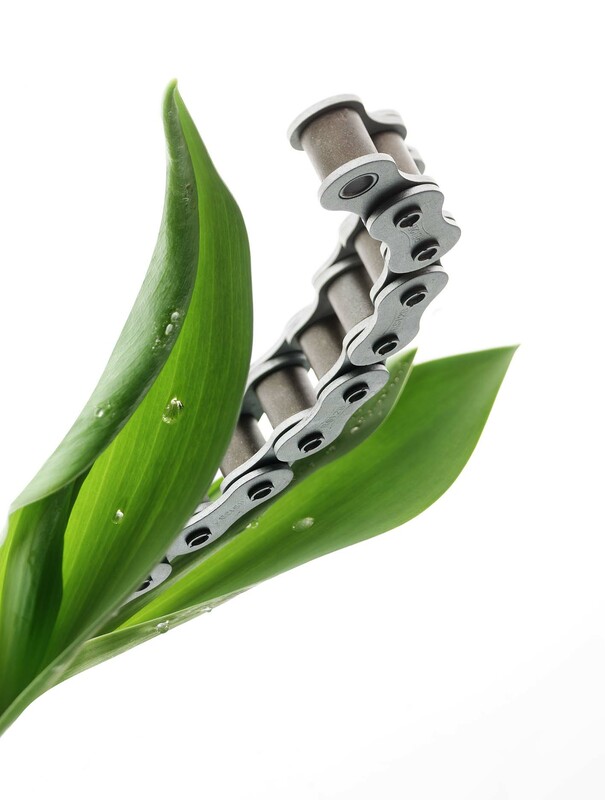 Finally, “NS” series chain is made completely from 316 stainless steel offering higher corrosion resistance that SS. Contact Tsubaki with your specific needs to determine the best anti-corrosive chain for your application.